Studio 10 is a monitor speaker with a monacor SP-310CX PA coaxial speaker and high sensitivity.The speaker was developed by journal Klang+Ton. The crossover consists of a first order high-pass filter (6 dB per octave slope) for the tweeter and a 3rd order low-pass filter for the woofer. 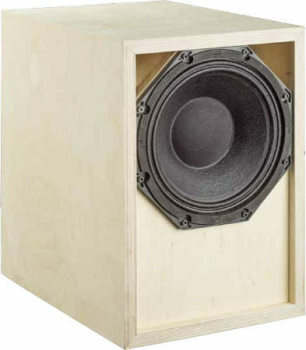 The frequency response of this speaker is linear. The decay spectrum is nearly perfect. At low volume, i.e. 85 dB at 1 m, the nonlinear distortions are not higher than 0.5% between 300 Hz and 10 000 Hz and doesn't exceed 2% at 95 dB at 1 m.